In arid conditions, even plants that are normally drought resistant will gorge themselves and grow more quickly than they should, producing “soft” growth that soon makes even the hardiest plants overdependent on irrigation. I was recently asked a very fair but very direct question: “Exactly how much water do my plants need?” Looking back, I realise that the “it depends” I offered as part of my answer may have been rhetorically neat but was less helpful than it should have been. In an attempt to assuage my guilt, I’ve decided to look at watering and irrigation again, but from a simpler, “how-to” perspective in the hope that this will be of more assistance. There are three basic steps to achieving an efficient and sustainable watering regimen in your garden: first, understand how much water your plants need; second, know how much water you are giving them and, third, arrive at the correct balance between supply and demand. And so we come back to the vexed irrigation question of “exactly how much?” The trick is to give your plants enough water without giving them too much. 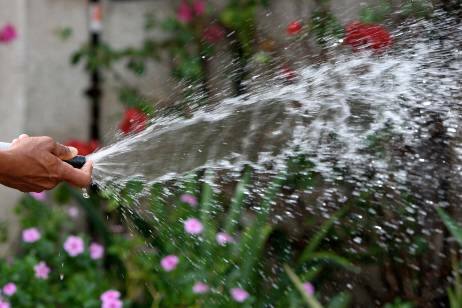 Watering too little can lead to wilting from which some plants might not recover. However, when you give plants more water than they need, several things can happen. In arid conditions, even plants that are normally drought resistant will gorge themselves and grow more quickly than they should, producing “soft” growth that soon makes even the hardiest plants overdependent on irrigation. To avoid this, it is often a good idea to prune plants at the start of summer and to apply fertiliser only when necessary in an attempt to reduce the amount of thirsty new growth. In extreme situations, over-watering can also lead to waterlogging that initially results in a loss of foliage but can ultimately kill a plant by starving its roots of oxygen. It is tempting to think of irrigation in absolute terms, and there are estimates stating that succulents can survive on a litre a day, lawn and ground cover on eight litres, and so on. However, this approach fails to account for other key variables such as soil quality. It also encourages gardeners to focus solely on the amount of water they are giving their plants when they should be considering the bigger picture. One of the reasons that different types of plants need different amounts of irrigation is that their root balls grow to different sizes and depths. As a result, a large tree needs more water than a small ground cover because it has a more extensive root zone, and the only way to ensure that such a plant is effectively watered is to make sure that irrigation is reaching these roots. Areas of turf need watering to approximately 100mm; small plants such as ground covers, cacti and annuals need watering to 150mm; and medium-sized plants such as shrubs and climbers need watering to 450mm. Large shrubs, trees and palms require at least a metre’s depth of irrigation. Seen from this perspective, there is no mystery to irrigation because the frequency and volume of water required become factors of soil quality and root depth. Since sandy soils in the UAE are naturally free-draining, less water is required to reach root zones. However, evaporation, high temperatures and poor-quality soils mean that the water isn’t retained for as long and irrigation is therefore required more frequently. The good news is that it is possible to measure all of these variables easily, and it should soon be possible to arrive at an irrigation schedule that is suited to both your soil condition and plants. Complex automated irrigation systems come with soil moisture sensors, but in smaller gardens a good way to test how deep you have watered is to use a soil probe (a sharpened piece of rebar or a very long screwdriver works well), although this also depends on the amount of time and effort you have invested in working your soil. About an hour after watering, push the probe into the soil. It should slide easily through wet soil but will be almost impossible to push through if the soil is dry. Water your plants until you can easily slide the probe to the recommended depth. This simple exercise allows you to calculate your actual irrigation needs. Once it is established, you can affect the frequency of your irrigation by reducing soil temperatures and evaporation rates. To achieve this, use surface mulches such as gravel or bark chippings and organic compost or commercially available, water-retentive additives such as Zeoplant to the soil. You should only do this, however, if you are gardening with species that are well suited to growing in rich, water-retentive soils. Arid, xeriscape plants will require free-draining conditions similar to the ones found in their native habitats. If that covers the “how much” and “how often” of irrigation, the “where” and “when” still need to be taken into consideration. Put simply, the “where” is a matter of directing the water where it is most needed, while the “when” is a matter of irrigating at the time when it will do the most good. Always apply water directly to the soil, and, through that, to the roots. When a plant grows in a container, the root ball develops around the edge of the pot, so early watering should be concentrated just beyond this point to encourage the development of a wider, more effective root system. Once the plant is established, however, the main root system will develop around the edge of its canopy, along the “drip line” where rain would fall naturally. This is where artificial irrigation should also be concentrated. Finally, please never, ever irrigate during the heat of the day. Whenever I see sprinklers going off in midmorning or afternoon it makes me mad, not only because it is so wasteful but also because it is so ineffective. Remember, plants don’t save water, people do. The best irrigation is done before sunrise and after sunset. There are a number of ways to save water but they all start with you. A version of this article originally appeared in The National, Abu Dhabi.